Once again snowy owls are being seen across the north land. 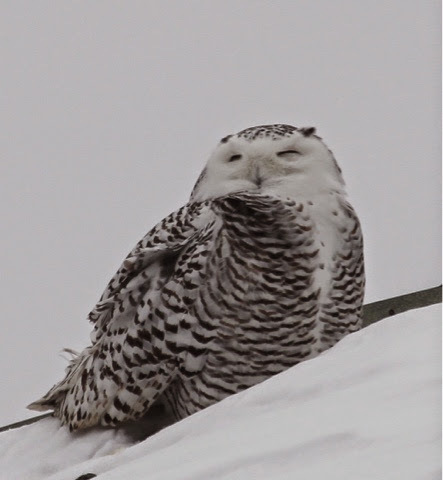 2014–2015 is turning out to be a pretty good season if you want to see a snowy owl. There probably have not been as many owls seen as were last winter, however, there still good opportunities to get out and see one of these magnificent birds if you're interested. Mike Hendrickson has complied a map showing all reported locations of Snowy Owls here in the capital of the North. You can also get up to the minute information by running a species report in eBird. Snowy owls seem to end up in some interesting places. Many of them do not seem particularly concerned about humans. One of the more popular and easily seen snowy owls around the Twin Cities has been hanging out at the Shoppes of Arbor Lakes shopping area in Maple Grove. The owl alternates sitting on top of the potbelly Sandwich shop, the AMC movie theater, and a beauty supply store. It may not be the most glamorous place to see if they snowy owl but it is certainly an easy place to see one. The photo at the top of this post is likely an immature female snowy owl and this is the one currently being seen at Arbor Lakes. Good luck, be safe, be respectful and enjoy the birds. Thanks for the post, Kirk. Very nice having the sightings map -- though it looks like it requires having GPS.